According to Joe Dwinell’s piece in Sunday’s Boston Herald, it’s all over but the pouting for the Store 2024 Olympic bid. The USOC will meet tomorrow on Boston’s shaky bid for the 2024 Summer Olympics, where one board member told the Herald she won’t be surprised if the 17-day, $4.6 billion plan comes up for a fateful vote. 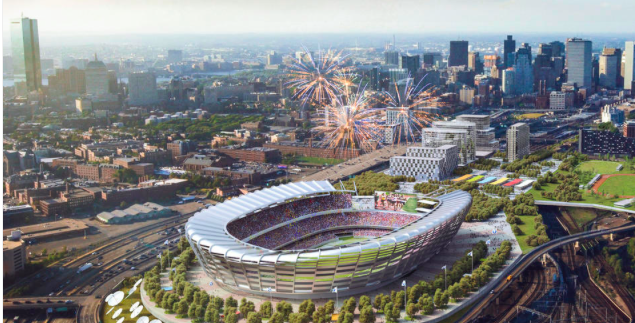 “We need to know how (Boston) is doing and if the people of the city are interested in hosting the games,” said Anita L. DeFrantz, a member of both the United States Olympic Committee and the International Olympic Committee. “We need to get a report. I need to know,” DeFrantz told the Herald yesterday, voicing doubt about support for the games in the Hub . . .
Crosstown at the Boston Sunday Globe, Mark Arsenault’s story was of course more nuanced. The US Olympic Committee is pressing Governor Charlie Baker and Mayor Martin J. Walsh to put more of their political capital behind Boston’s struggling bid for the 2024 Olympic Games, but neither politician appears ready to satisfy the USOC, according to a person close to the bid process. With USOC members set to discuss Boston’s status at a board meeting Monday, the standoff raises new questions about the fate of a bid already in peril due to low poll numbers. USOC members want the popular governor to endorse the bid, the person close to the process said, which could breathe new life and credibility into the city’s effort. The board is also pressuring Walsh, an Olympic backer, to announce that he will sign the host city contract required by the International Olympic Committee, which would put city taxpayers on the hook if the Games ran short of money or suffered cost overruns, the person said. Not gonna happen, according to Arsenault’s report. More to come, obviously, today. This entry was posted on Monday, July 27th, 2015 at 10:25 am and is filed under Uncategorized. You can follow any responses to this entry through the RSS 2.0 feed. You can leave a response, or trackback from your own site.